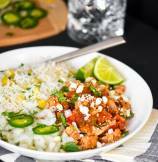 I have been waiting eagerly to share this, my very favorite, Mexican Spicy Chicken Tinga with all of you. 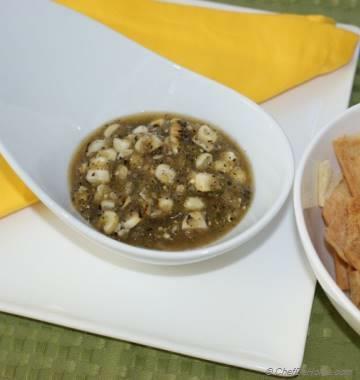 I'm a Mexican Food Addict and love exploring new Mexican dishes. For the record, this cuisine never stops to amaze me! From sometime, word "Tinga Chicken" was buzzing in my ears. Whenever I visited local Food Stores, saw this Chicken Tinga in frozen food isle and also heard name a few times on TV. Word "tinga" somehow reminds me of Indian Hindi word "Tikha" which means "a zesty and tangy food preparation". Strange but seriously true, when I actually tasted Tinga Chicken, first time, turns out that's what "Tinga" is all about: spicy, tangy, smoky, and flavorful! However, just so that you know, "tinga" is reference to Mexican Tostadas topped with shredded spicy chipotle-herbs chicken or meat. In one line I would describe this Mexican chicken dish as zesty, flavorful chicken with smoky spice of chipotle, roasted poblano, and yummy tangy taste of green tomatillos! Oh me! Even describing it makes me hungry for some Chicken Tinga! yummo! 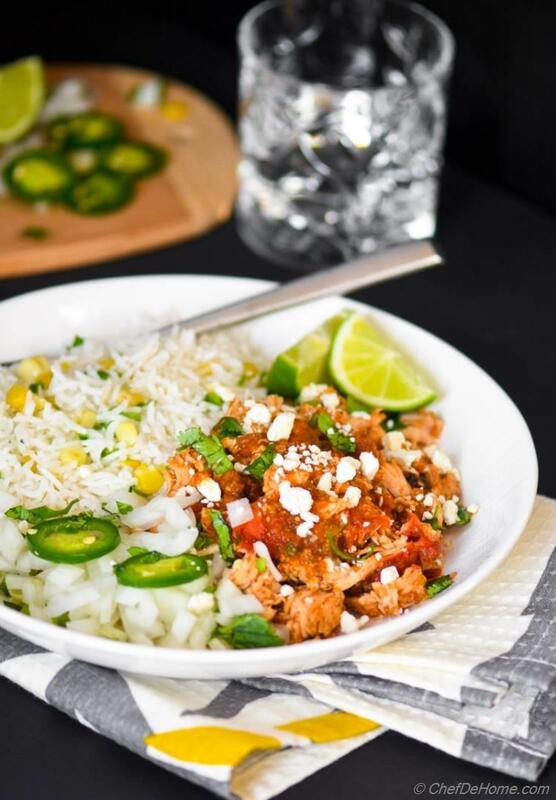 For my love of Chipotle and Poblano, and oregano (of course) and my love for zesty Mexican food, this recipe had to make it to the blog. So here I am, sharing my favorite Chicken Tinga. 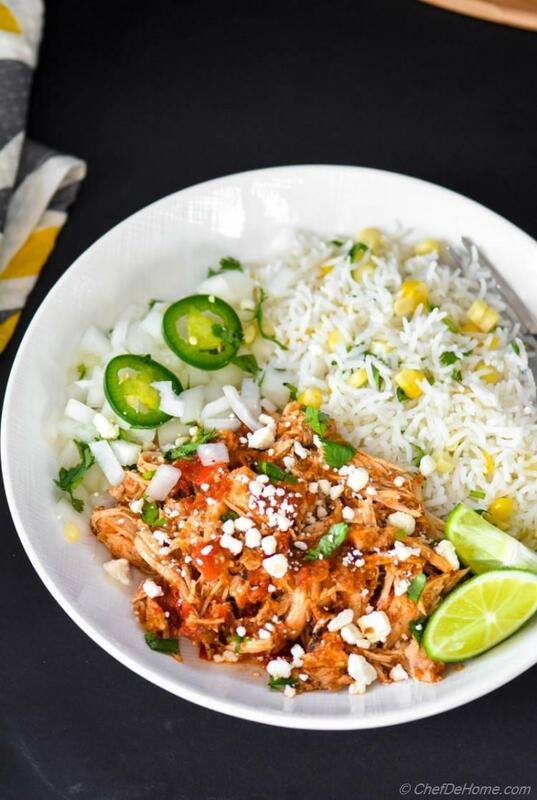 I have cooked Chicken Tinga in Slow Cooker which makes it perfect choice for weekday dinners, especially for Taco Tuesdays! Once everything hits the slow cooker pot, your cooker works for you and you just carry on with your day. In the evening, dinner will be ready to serve! Whenever I use my slow cooker, I always think.... I should have bought it earlier. Now, since I have it, you will see slow cooker recipe very often! It's an useful kitchen appliance and I'm so glad to own it. Shredded chicken tinga is my personal choice. I think it makes chicken more evenly coated in sauce so that you can taste the spice in every bite. Also, this makes it perfect for filling in tacos. You can always keep chicken pieces bigger or just cube'em after cooking instead of shredding. Spices in this recipe are totally as per my taste. Traditional Chicken Tinga also has herb Marjoram, but I loved the taste even without it. Feel free to add 1 sprig if you prefer. Also, this preparation tends to be bit hot & spicy and we love spicy food in my home. 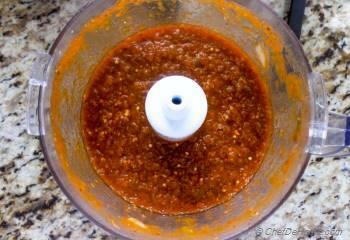 You can always use 2/3 of the sauce instead of all to adjust the spiciness. Or add more chicken to reduce the per serving amount of spice. 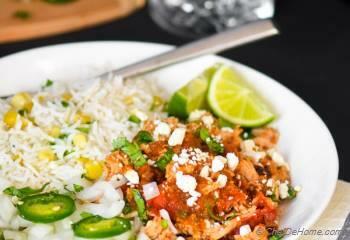 If you are fan of my Chipotle Sofritas recipe, this Chicken Tinga will become your new favorite! I promise! If not using slow cooker, make the tinga marinade, add raw chicken and leave in refrigerator for 30 minutes (at least) to marinate. 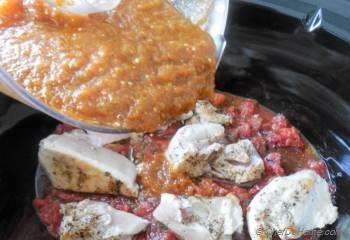 Then heat oil in deep heavy bottom pan, add chicken with marinade and cook for 5-7 minutes or until chicken in no longer pink. 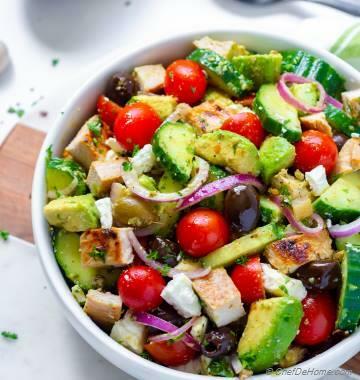 Add chopped tomatoes and other seasonings mentioned in the recipe below with 1/2 cup water. Cover and simmer until chicken is fully cooked. (20-25 minutes) Check once or twice in between, if water appears very less, add 1/4 cup more. I made Corn Rice to accompany Tinga Chicken. I will share the recipe soon. Tinga Chicken is gluten free, dairy free, and also nut-free. I hope you enjoy the recipe! Tuesday is approaching! 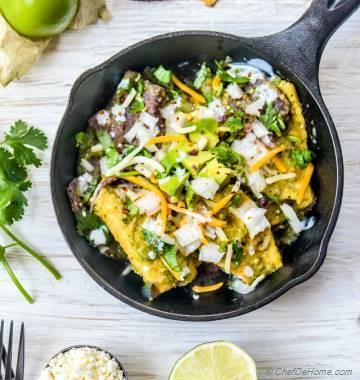 Plan it today and serve it for Taco Night tomorrow!! Cheers to flavorful Home Cooking!! Smart Swap How about some Lamb Tinga? 1. Ready all required ingredients. 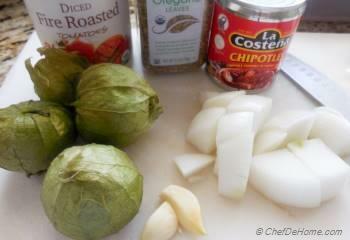 Chop onion, peel garlic and get ready to make some Tinga Chicken! 2. 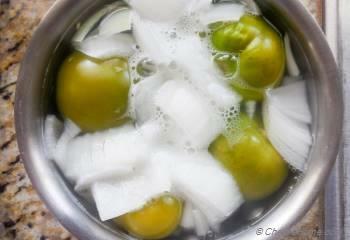 In a sauce pan, add tomatillos and onion and boil rapidly for 5 minutes or until color of tomato change to pale green. 4. 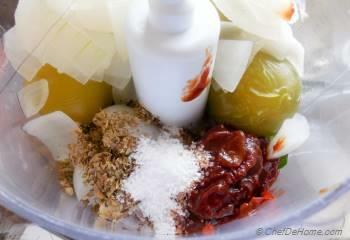 Process to make a fine puree marinade. 5. Heat 1 tbsp oil a saute pan. Season both sides of chicken with salt and black pepper and sear until nice and brwon from both sides (2-3 minute each side.) Chicken will not be fully cooked. Just has a nice brown crust. 6. Layer roasted canned tomatoes on the bottom of slow cooker. Top with chicken pieces. and cover with tinga marinade. make sure to cover chicken with sauce. 7. Place the slow cooker lid and cook on "low" for 6 hours or on "low" for 4 hours and on high for "30-40" minutes. 8. Once done cooking, take out chicken pieces, and shred with fork or with clean hands. Careful! it will be hot! Return shredded chicken to the sauce. Coat evenly. Set aside in slow cooker on warm setting. 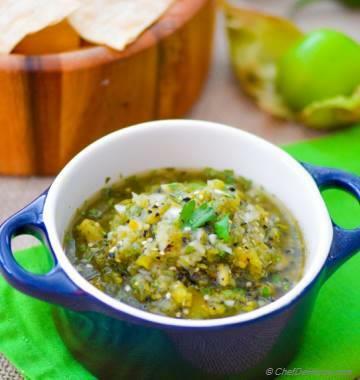 Or Serve immediately with rice and fresh salsa! Nice to meet you Savita!! 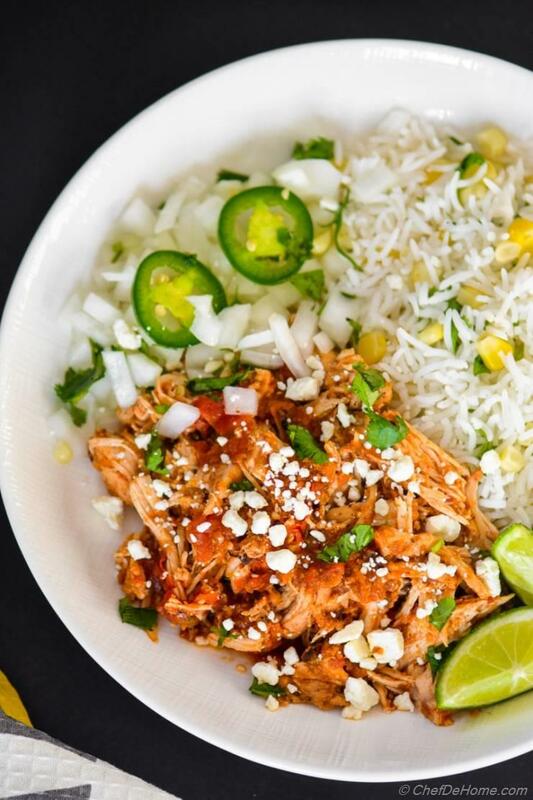 Chicken Tinga looks really good with side of rice. Anu, thanks! :) glad you like t! Sounds really delicious Savita. 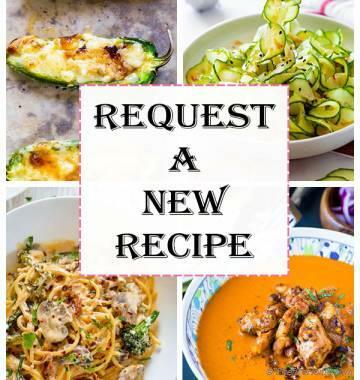 Love your recipes - They are all so mouth-watering! Never heard of corn rice before...can't wait for the recipe! Kimberly, glad you like this chicken. Corn Rice are very simple and really delicious. Will share recipe soon!